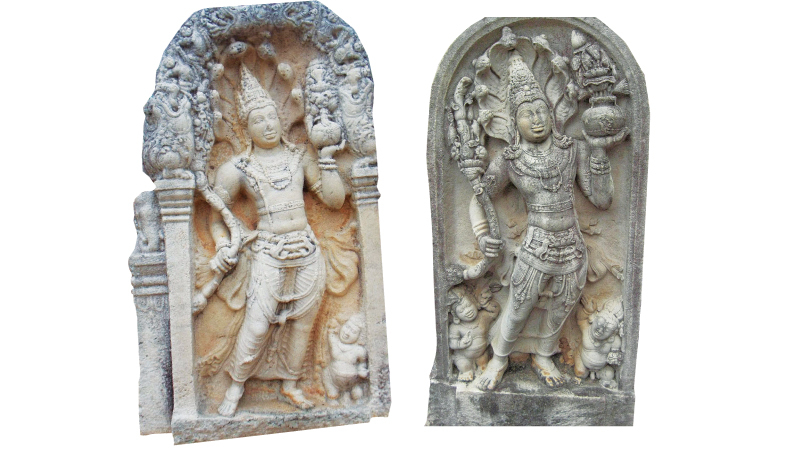 All over Sri Lanka, archaeological sculptures are found. They provide a wealth of information about the ancient Sri Lankan culture, tradition and civilization. Sri Lankan architectural patterns, most of the temple structures, cultural chambers, sculptures and paintings resemble those of Indian traditions. Despite such similarities, Sri Lanka preserves its own identity. Archaeological sites of Sri Lanka play an important role in society. The buildings were not built for general purposes. They were considered as community development centres. The construction of worshipping places has its own patterns and plans, which resemble their own culture, customs, and traditions, regional and religious influences of different periods. Besides, the construction patterns of each worshipping place and region provide ample evidence of the ruler’s taste. Ancient Sri Lanka rulers built buildings with their own involvement. These buildings till today reveal as evidence of their deep involvement in art, culture, tradition and religion. Earlier guard stones were installed at Buddhist temples, royal palaces, important royal courts, water reservoirs and cultural chambers. In Sri Lanka, a variety of guard stones is found at different archaeological sites. Sri Lankan ancient guard stones are unique in nature. They are in standing postures with a curved body and different foot positions. All these resemble the beautiful classical dance stand poses and postures. In technical terms, the stands of dance and body positions are often referred to as Mandala Isthana positions. Some Naga Raja guard stones are portrayed with five heads, others have seven or nine heads. Different scholars interpret different views about the heads of the Naga Raja guard stones. Some interpret that the five-headed Naga Raja guard stones symbolize the five different senses of the living beings such as sight, sound, smell, touch and taste. Meanwhile, some scholars believe that the five-headed Naga Raja were created just only for decorative purposes. Anyhow the hood of the guard stone is more often covered with multiheaded cobras. The guard stones are highly decorated with beautiful ornaments and layers of waist chains. The stone carved costumes of the guard stones resemble the beautiful dance costumes. Besides, beautiful ear and chest ornaments and highly crafted head crowns are worn by the sculptures. They show a close resemblance to some of the ancient Indian sculptures. Generally, beautiful Naga Raja guard stones could be found in many archaeological areas of Sri Lanka, especially in the Anuradhapura and Polonnaruwa areas. Heads of the Naga Raja were decorated with exclusive beautiful ornaments. Over some guard stones, Makara heads were installed. At the base of the arch, lion and dancing human figures were depicted. One hand of the guard stone carries Punkalasa (a pot) and the other hand holds a bunch of buds and flowers. With the passage of time, Bahirawa was added to Naga Raja guard stones. Bahirawa was added to protect wealth. Sankha and Padma the two Ganas (Yakas) were installed at the feet of Nagaraja.